The Olympics have come to a close, and that means scripted television has returned to our sets. Arrow and the Black Canary face off against a classic DC villain while Adventure Time's Ice King gets a second chance as Simon. Plus, Vikings returns, and we learn what's next for The Walking Dead's Daryl and the True Detective duo. Check out clips and details below! Tonight's episode sounds particularly heartbreaking. After a magical spell turns the Ice King back into Simon, he manages to bring his beloved Betty back. 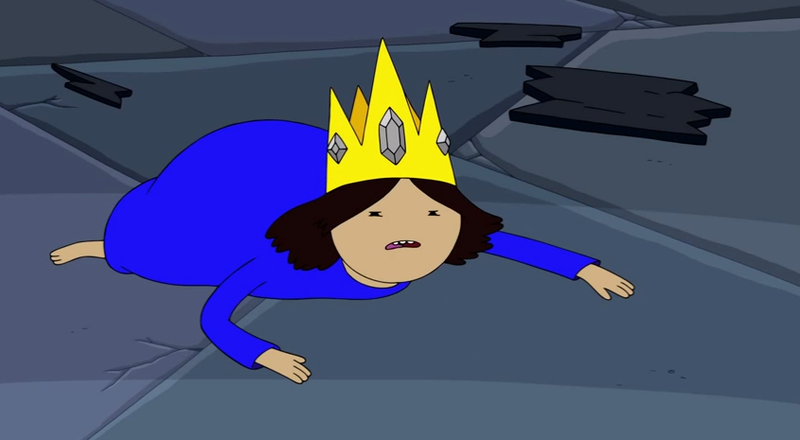 Unfortunately, the rules of the Ice King's crown still apply—meaning Simon will die without it. Almost Human's first season is in its home stretch, and in its penultimate episode, we have another crime involving the genetically enhanced chromes. Will Detective Stahl get involved? When Det. Kennex and Dorian investigate the murder of a "chrome," there are no signs of trauma, other than a very small pinprick on the back of his neck. As the investigation unfolds, it's revealed that the murder suspect is tapping into the DNA of his victims in pursuit of perfection. Someone in the Pack dies tonight, forcing the Pack to go on the offensive. And they were just considering a truce. Steven Universe creator Rebecca Sugar sang the song "Giant Woman" at this past summer's San Diego Comic-Con (you can listen to it above accompanied by an Adventure Time fan animation), and it features in tonight's episode, in which Steven tries to convince Pearl and Amethyst to fuse together into a giant woman. Roman (Matt Lanter) and Sophia (guest star Brina Palencia) prepare for a funeral. Roman is surprised and suspicious when his Uncle Castor (guest star Johnathon Schaech) shows up in the sector offering to help the family. Meanwhile, Emery (Aimee Teegarden) tries to talk to Roman about what happened, but he doesn't want anything to do with her. Upset, Emery turns to Grayson (Grey Damon). Meanwhile, the Atrian Seven are invited to the school carnival. However, the fun ends after Drake (Greg Finley) is kidnapped and Roman finds out the Trags are preparing a hit on Emery and her family at the carnival. In order to save Robbie, Sally summons Donna in order to make a deal. Meanwhile, Aidan ends up in vampire rehab. The Archer Vice crew is back this week and headed on a road trip after Malory buys a bus. Dyson is put on trial for murdering humans and Fae, and the punishment is death. So Lauren and Bo team up to head into his memories. So another of Gabriel's pals is accused of dastardly deeds. Is he unlucky or just a terrible judge of character? While Gabriel and Riley are in Bolivia protecting a presidential candidate from an assassination, Gabriel is stunned to learn his best friend from Delta Force is the suspect. Stiles checks himself into the mental hospital Eichen House to keep himself from hurting anyone else. Meanwhile, Scott and the others search for an important artifact. Johnny finally decides that he's had enough of being the twins' guinea pig and quits. But when he changes his mind, he discovers that the girls have made a crash test robot. When Rebekah (Claire Holt) finds herself locked up in the sanatorium where she worked in 1919, she realizes a witch named Genevieve (guest star Elyse Levesque) is back to seek revenge and to reveal dark secrets that would destroy Rebekah if exposed. A distraught Elijah (Daniel Gillies) turns to Marcel (Charles Michael Davis) and Hayley (Phoebe Tonkin) for help when one of his decisions puts Klaus (Joseph Morgan) and Rebekah's lives in danger. With time working against them, Marcel realizes he may hold valuable information that could lead them to Rebekah and Klaus, but revealing it will almost certainly result in deadly consequences. Sam (Jared Padalecki) and Dean (Jensen Ackles) are stunned to discover the Men of Letters' bunker is haunted. Their investigation leads them to a storage facility where the demons have been keeping a prize possession. Meanwhile, Castiel (Misha Collins) is captured by Bartholomew (guest star Adam Harrington). What happens when the Machine team meets up with a more conventional information center? Also on TV: On Faceoff, the competitors have to create a wizard to match a wand (9 PM, Syfy). After Robin tries to destroy some pesky mockingbirds, they come back "bigger, stronger, and ready to mock." Oliver (Stephen Amell) brings Sara (Caity Lotz) into the Arrow team. Watching Oliver and Diggle (David Ramsey) spar with Sara and talk old scars, Felicity (Emily Bett Rickards) starts to feel left out. The team is investigating a villain named William Tockman, a.k.a. The Clock King (guest star Robert Knepper), who is a brilliant thief armed with technology that can open any bank vault in Starling City. After The Clock King infiltrates the computer systems in the lair, Felicity feels pressure to prove her worth. When she gets a lead on Tockman's whereabouts, she heads out without the team, putting her in peril. Meanwhile, Oliver throws Sara a welcome home party, but Laurel (Katie Cassidy) refuses to attend. After Lance (Paul Blackthrone) makes his case for a family dinner, Laurel acquiesces, but when Oliver shows up with Sara, she loses her temper on both of them. Snoutlout is expelled from the Academy for disobeying orders and Alvin comes back to Berk to make amends. Every time I see a reference to New Vegas, I think of Fallout and ask myself, "Why can't Revolution be more like Fallout?" With their lives in danger in New Vegas, Monroe (David Lyons) and Connor (Mat Vairo) face a difficult decision in order to survive. Back in Willoughby, Miles (Billy Burke) questions whether he can trust Neville (Giancarlo Esposito) and Jason (JD Pardo) to help take down the Patriots. Meanwhile, Aaron (Zak Orth) and Priscilla (Maureen Sebastian) find themselves at odds over the nano code. After getting some shocking news, Stephen (Robbie Amell) attempts to restore order in both his worlds by making a deal with Jedikiah (Mark Pellegrino). With a new break-out on the loose, Cara (Peyton List) and Russell (Aaron Yoo) try to lure him in but must contend with a trap from Ultra. Meanwhile, Jedikiah is closer to developing a new secret technology that could change his future. Ooh, do we get to see Professor Hickey's duck comics in this episode? Professor Duncan (guest star John Oliver, "The Daily Show") decides it's time to seduce Britta (Gillian Jacobs) and Jeff (Joel McHale) counsels him on how to close the deal. Meanwhile, Britta runs into some old friends and realizes that they have moved on from their shared anarchist views of the past. Abed (Danny Pudi) runs afoul of Professor Hickey (Jonathan Banks) when he accidentally damages some drawings Hickey has been laboring over. When Hickey restrains Abed as punishment, the two wind up spending some meaningful time together. Meanwhile, Chang (Ken Jeong) finds himself performing an impromptu one-man show for a ghostly audience. As Damon's (Ian Somerhalder) behavior escalates from destructive to deadly, Stefan (Paul Wesley) begins to regret their last conversation and decides to track Damon down and intervene. For reasons of her own, Elena (Nina Dobrev) volunteers to come along. Dr. Wes (guest star Rick Cosnett) enlists the Travelers to set a trap that will once again test Damon's friendship with Enzo (guest star Michael Malarkey). After a heart-to-heart talk with Nadia (guest star Olga Fonda), Matt (Zach Roerig) enlists Caroline (Candice Accola) and Tyler's (Michael Trevino) help to protect Elena, leading to a violent confrontation. Later, when Stefan tries to comfort a dejected Caroline, their conversation leads to a horrifying realization. Monroe (Silas Weir Mitchell) fights an impossible battle to convince his parents (guest stars Dee Wallace and Chris Mulkey) to embrace the life choices he's made. Meanwhile, Nick (David Giuntoli) turns to Juliette (Bitsie Tulloch) to help him figure out the Wesen aspect of his cop-killing scalper investigation. On the Royal Baby front, Captain Renard (Sasha Roiz) learns new information that forces him to contact Adalind (Claire Coffee) in the interest of keeping her and the baby safe from Viktor (guest star Alexis Denisof). Hatake reveals why the CDC is really on the base, prompting startling alliances. The team performs another round of ballistics experiments, seeing if they can get a ping pong ball to travel at supersonic speeds and if they can build a functional canon out of ice. This week's episode is titled, "Plants Are Living Things, Too, Baby." In the present, Hart and Cohle call a truce in order to investigate a string of disappearances that seem tied to the symbology of the Dora Lange murder and the Tuttle family. We're back to spending time with Beth and Daryl this episode, but Daryl's once-trusty crossbow bolts are starting to see some wear and tear.